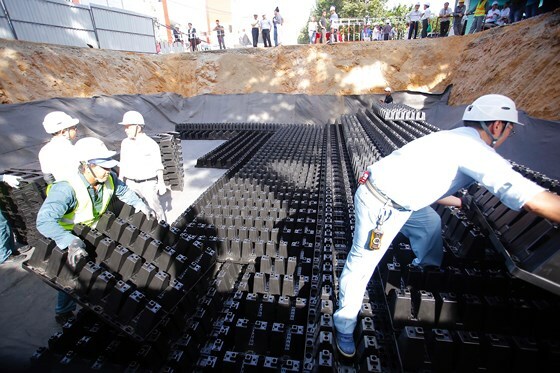 HCM CITY — HCM City’s Steering Centre for the Urban Flood Control Programme has sought the People’s Committee’s approval to build five more underground reservoirs using Japanese Crosswave technology to prevent floods in the city. Nguyễn Hoàng Anh Dũng, deputy director of the centre, said the first reservoir on Võ Văn Ngân Street in Thủ Đức District had been successfully trialed and it proved as effective as expected. Dũng said streets in the area used to be frequently under 10-15cm of water it the rainfall reached 30 mm before the reservoir was built. The locations are Hoàng Văn Thụ Park in Tân Bình District, Gò Vấp Floral Park Village in Gò Vấp District, a culture park in District 10, the central reservation on Phan Xích Long Street in Phú Nhuận District, and the area between the Ward 15 police station and Alley 48, Điện Biên Phủ Street, Bình Thạnh District. With a combined designed capacity of 1,500-20,000 cubic metres, pumping stations and garbage collection systems, they will cost an estimated VNĐ475 billion (US$20.5 million) to build. “When the reservoirs are built, people living in flood-prone areas will not suffer flooding any more,” Dũng said. Hồ Phương, deputy chairman of the Bình Thạnh District’s People’s Committee, said it would not be feasible to build an underground reservoir on Điện Biên Phủ Street as proposed. He suggested moving the reservoir to Alley 135 on Nguyễn Hữu Cảnh Street, which is frequently flooded during rains. The Tân Bình District People's Committee also called for reconsidering the Hoàng Văn Thụ Park location.